Not established: Although the principle of regular clinics is widely accepted, its periodicity varies widely and is dictated by local availability of medical resources (29) and traditions. Yearly visits may be a drain of medical resources, whereas intervals greater than two years may be equivalent tlling the patient they are no longer in need of follow up. Remains an important concept: Whatever the periodicity, neurosurgeons must remain proactive in proposing regular follow-up, even to reluctant patients. Baseline scans must be available: A set of images that show the brain in a well-treated state is mandatory (42), since a new scan done at a time when a shunt malfunction is suspected may be difficult to interpret in the absence of a reference. The size of the ventricles stabilizes 6 months to 1 year after shunt surgery (54). Therefore, baseline imaging should not be done too soon after surgery. Image segmentation for calculation of the ventricular volume should allow accurate diagnosis of shunt failure in stiff brains. Ascertaining, prescribing, retrieving, and labeling the baseline imaging should be part of the care for all patients with hydrocephalus, and their reference images should be part of the digital data immediately at hand when necessary. Scans for each visit are not always necessary: Systematic imaging at each visit of an asymptomatic patient has not proved its worthiness. Plain x-rays of shunt may be desirable: Although the use of plain x-rays at follow-up visits is not established, shunt series are the only way to assess continuity of the drainage system, thereby allowing the diagnosis of shunt failure at a presymptomatic stage; neurosurgeons often obtain plain x-rays routinely during clinics (44). Baseline T2-weighted MRI is important: After an ETV, MRI is the only technique allowing for the assessment of the ETV. A lateral view in T2-weighted sequence is the most informative, showing elevation of the floor of the third ventricle and a flow void through the ETV. Patients should be warned that the ventricles will remain large, unlike after shunting. Study of the tectal plate should not be forgotten, because tumors may become apparent over time, particularly when the tectal plate was originally felt to be dysplastic. Patients who are doing well following a successful ETV but who have no flow void at the floor of the 3rd V may be at a higher risk for occlusion. Systematic periodic MRI vs. scanning when closure is suspected – no consensus exists: When closure of an ETV is suspected, the threshold for reoperation should be low, even in an asymptomatic patient. These patients are at risk for sudden catastrophic deterioration (17); “asymptomatic” patients with obstructed ETVs often appreciate their symptoms only in retrospect after the ETV has been reopened. Recent concerns about frequency of use require awareness: The risks of tumor induced by diagnostic radiation have been invoked but not documented with certainty (41), and this possibility is still theoretical. Minimizing the radiation dose to the patient should, however, be an imperative. MRI is preferred when possible: MRI is preferred to a CT scan whenever possible. Shortened MRI protocols reduce the duration of immobility required, allowing for light sedation or none at all in younger patients. However, until new developments in X-ray-free imaging occur, shunt series will continue to require plain X-rays. Very few patients with shunts will eventually become shunt-free. Broken shunt tube on x-ray may be functional: In some instances, a patient followed in clinics will present with a shunt series showing disconnection with no clinical symptoms. It should be emphasized that broken shunt does not mean nonfunctional shunt. 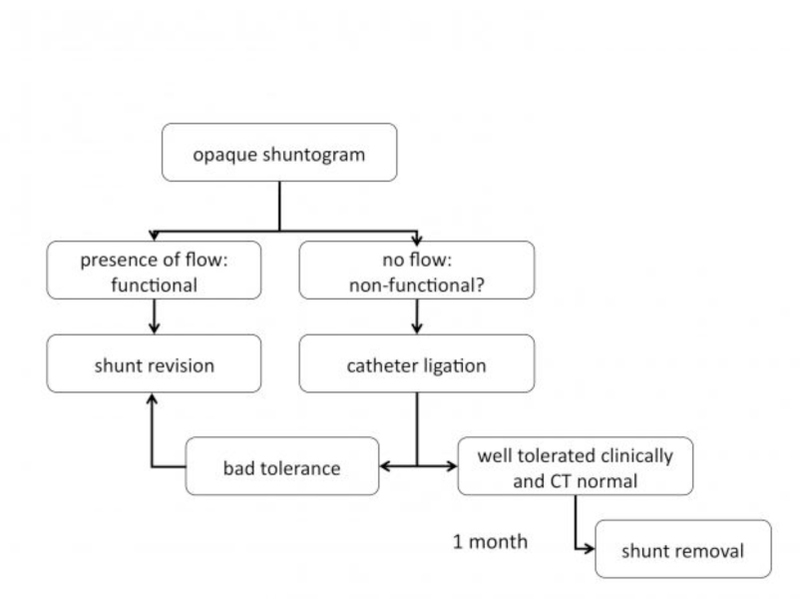 Candidates for weaning off shunt must be carefully selected: In the practice of the author and his colleagues, shunt weaning is considered when the shunt is ruptured, the patient is asymptomatic, and he or she has never undergone shunt revision (44). Different protocols have been proposed to assess shunt-independence, including monitoring of ICP (31). The author and colleagues perform a shuntogram in the OR, followed either by revision if the shunt is patent or by ligation if it is not. When the shunt is ligated, it is removed 1 month later if the patient remains asymptomatic and the CT is normal (see figure). In other cases, shunt weaning has been achieved after forced shunt removal for infection or after successful secondary endoscopic surgery. Weaned patients must be followed: Clinical and radiological follow-up is necessary for all weaned patients because of the possibility of delayed deterioration after apparently successful shunt weaning. The duration of the required follow-up in such cases is not established but should probably exceed a year.